Imagine dim sum as a kind of sport, where the scoreboard is your bill. 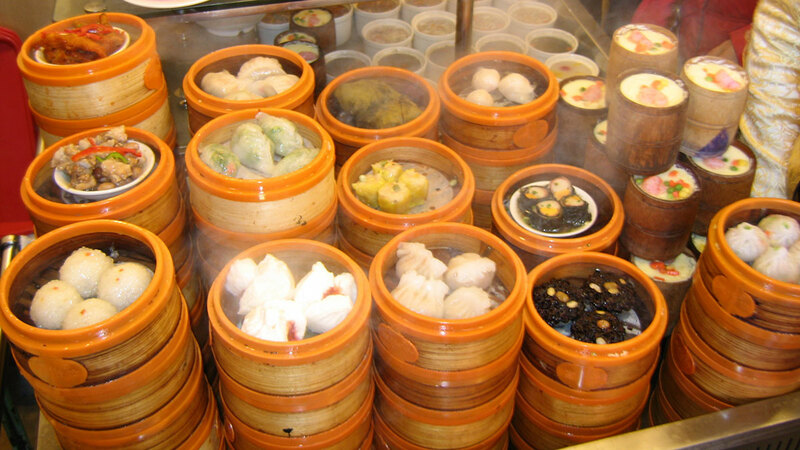 Delivered in noisy metal carts and strategically dropped onto your table by waitresses who don’t speak English before you can say whether you want the dish or not, authentic dim sum in Edmonton (no, not Good Buddy) satisfies Chinese Canadians and gives Westerners a culture shock in their own city. Dim sum is essentially Chinese brunch, but unlike traditional North American brunch, you’d be hard-pressed to find anything that hasn’t been steamed or deep-fried. While you won’t see any fresh fruit or toast at these restaurants, dim sum is cheap, filling, and delicious, which makes it the perfect breakfast for the low-income university student waiting for their trust fund to kick in. The Golden Rice Bowl hosts wedding receptions most nights, simply because the restaurant is so visually stunning. While it’s easily the priciest dim sum in the city, you pay extra for both décor and flavour. The curry squid and shumai (pork dumplings) are always hot and fresh, particularly if you order them instead of waiting for the trolleys to come around. While the food is good and the staff are friendly, Golden Rice Bowl lacks the personality (and, to some degree, the authenticity) other dim sum restaurants have. But, if you go on Sunday, you won’t miss the owner, a lively, eccentric elderly woman in a fuchsia pantsuit who introduces herself to every table and makes sure things are running smoothly. She’s the kind of micromanager I hate as an employee, appreciate as a customer, and admire in a businesswoman. My ex-boyfriend, who first introduced me to dim sum, hailed from Guangzhou, and his family practically lived in this restaurant. If you’re from the Chinese coast, or take yourself to be a dim sum connoisseur after traveling through East Asia, Jumbo will be immensely gratifying. Unlike other dim sums, just as its name suggests, the portions are huge. Also unlike other dim sums, the food isn’t excessively salty or greasy, and you’re bound to be happy with whatever dish you order (although the sticky rice, coconut buns, and seafood chow mein stand out). But Jumbo is not for the faint of heart. This is one of those Chinese restaurants where you have to fight for your food by walking up to carts with your bill and grabbing what you want. Like at most dim sums, if you’re white, you will be treated differently than Chinese customers — your chopsticks might be swapped for a fork by the server, or the waitresses might skip your table all together. Loud, overcrowded, and inexpensive, Dynasty brings the vibrancy of Hong Kong to a rough, destitute neighborhood in downtown Edmonton. For health and safety reasons, everyone who plans on dining here should know about the restaurant’s recent history. Dynasty attracted most of the staff who worked at nearby Mirama, which was Edmonton’s largest dim sum restaurant until it was shut down in 2011 due to health code violations. Before it closed, Mirama was frequently the backdrop for gang violence, and this reputation came to Dynasty after the restaurant was closed — in fact, the restaurant owner, Chi-Lik Wong, was shot and killed in his driveway in 2012. Dynasty has gone downhill since Wong’s death, and in February of this year, the restaurant was fined $42,000 after health inspectors found insects in the kitchen. But, really, what’s the difference between cockroaches, the horse meat in Ikea meatballs, and whatever’s in the hotdogs they sell at M&M Meats? Sit tight, brush the flies off your shrimp dumplings, and don’t go fishing through your congee (rice porridge). It tastes great no matter what’s in it. A reminder, any comments not adhering to community guideline will be deleted. Thanks everyone!